BEAUTIFUL: THE CAROL KING MUSICAL, the story of singer/songwriter Carol King before she was famous, when she was a teen-aged songwriter turning out some of the biggest hits of the generation, returns to the Fabulous Fox, March 12-17. Even before Carol King became an overnight star with the release of her 1971 “Tapestry” album, people already knew her music, even if they didn’t know her name. She wrote some of the biggest pop hits of the ’50s-’60s, including “Will You Still Love Me Tomorrow?,” “Some Kind Of Wonderful,” “One Fine Day,” “(You Make Me Feel Like) A Natural Woman”- and others. Her songs were hits for stars like Aretha Franklin, the Shirelles, the Drifters, and were even covered by the Beatles (“Chains”), and many are included in this musical. Fans turned out in force for the return of this tuneful musical on opening night. The crowd-pleasing Broadway musical, based on the early career of Carol King, was written by Doug McGrath. The production is directed by Marc Bruni, with choreography by Josh Prince. Along with her songwriting partner and husband Gerry Goffin, who wrote the lyrics, Carol King wrote some of the hits that made up the soundtrack of an era. But before all that she was a pony-tailed 16-year-old with a dream to become a singer/songwriter. 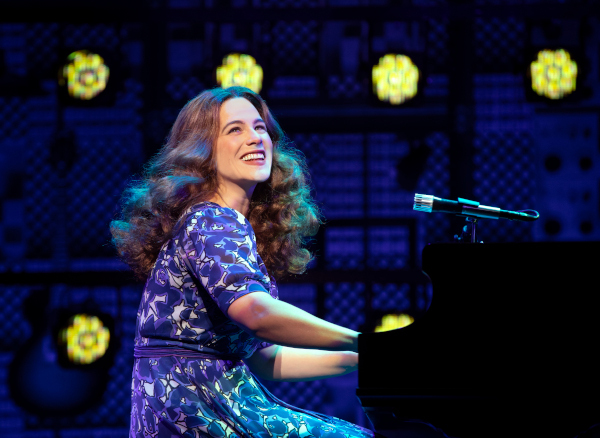 BEAUTIFUL opens with the Carole King (Sarah Bockel) most people recognize – the star on stage, seated at her piano, with her big smile, long curly hair and long flowered ’70s dress, singing “So Far Away.” That nostalgic tune is the perfect segue to take us back to New York, where the teen-aged Carol Klein lives with her single mother (Suzanne Grodner). At 16, Carol is already in college, having skipped two grades but her mother insists that her musically-gifted daughter study to be a music teacher. Her mother is dubious about Carol’s real dream, of being a singer/songwriter, but Carol persists in pitching songs to the music producer/publishers in Manhattan, using the name Carol King. Finally, Carol finally sells a song to music producer Don Kirshner (James Clow), who signs her up to be a “girl songwriter,” writing female-centric hits for the “girl groups” and woman singing stars of the era. But producer Kirshner who wants more songs – now – and Carol struggles with writing lyrics. At college, she meets student planning to be studying to be a playwright, Gerry Goffin (Dylan S. Wallach), and they form a songwriting partnership that quickly becomes a romantic one as well. Soon, they are married and have a daughter, living as struggling songwriters looking for a hit. The hit finally comes, followed by many more. BEAUTIFUL is filled with humor and heartache, as it follows Carol’s rising career and personal life. They become friends with another songwriting couple, Barry Mann (Jacob Heimer) and Cynthia Weil (Alison Whitehurst). Mann and Weil wrote famous hits too, such as “You’ve Lost That Lovin’ Feeling,” “On Broadway,” and “Here you Come Again.” All their careers take off but their personal lives have more ups and downs. 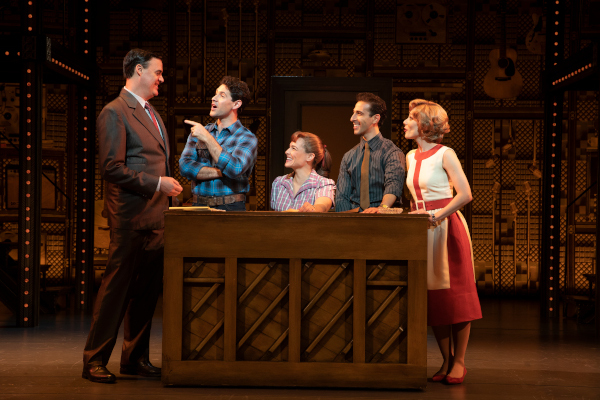 (l to r) James Clow (“Don Kirshner”), Dylan S. Wallach (“Gerry Goffin”), Sarah Bockel (“Carole King”), Jacob Heimer (“Barry Mann”) and Alison Whitehurst (“Cynthia Weil”), in BEAUTIFUL: THE CAROL KING MUSICAL. Photo by Joan Marcus. Courtesy of the Fox Theater. This is a challenging role for Sarah Bockel, who has to not only act but look and sing like Carol King, Bockel carries it off wonderfully, handling all the aspects of the part with equal brilliance. All the cast is good, each charming and energetic, whether handing the comedy, drama or singing. The supporting cast, appearing as the singers who performed the hit songs, are just as wonderful. The staging for these mini-concerts are terrific, with shimmering curtain backdrops and the singers, in glittering sequins and satin costumes, belting the out with all the choreographed moves. The play’s action moves briskly, sometimes requiring clever quick on-stage costume-changes and sliding or rotating sets to transform the location. The multi-level moving sets and the dazzling costumes are one of the show’s highlights, amazing and delighting the audience as much as the wonderful performances. Fans of ’50s-’60s pop music will delight in this musical as much as Carol King fans, but they will have to hurry to catch during its too-brief run at the Fox. 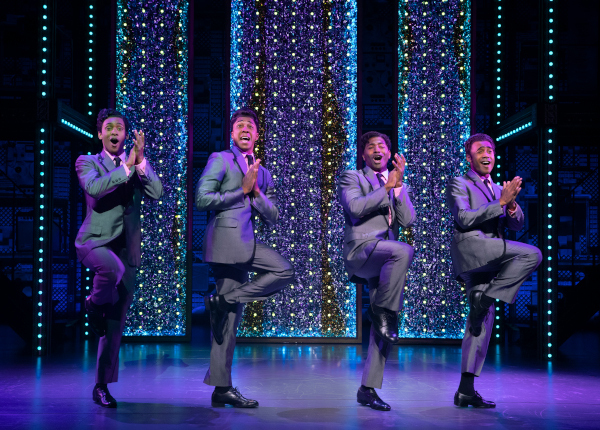 The Drifters, (l to r) Deon Releford-Lee, Nathan Andrew Riley, Michael Stiggers, Jr. and Dimitri Joseph Moïse, in BEAUTIFUL: THE CAROL KING MUSICAL. Photo by Joan Marcus. Courtesy of the Fox Theater.